ClarkVision Photograph - Look Mom, at How Much We Ate! Look Mom, at How Much We Ate! 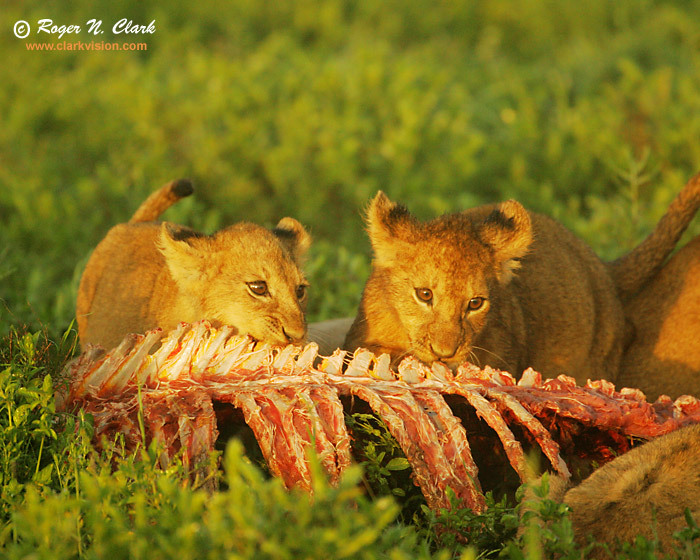 Lion cubs eating a zebra just after sunrise on the Serengeti in Tanzania, Africa. The pride of 9 lions (2 males, 3 females, and 4 cubs) had killed 2 zebras. The 2 male lions ate one and the females and cubs ate the other. The cubs didn't actually eat much, being quite young and still suckling. The pride had no challenges from other predators, so they had an undisturbed feast. Technical: Canon 1D Mark II 8-megapixel camera, Canon 500 mm f/4 L IS lens plus a 1.4x teleconverter giving 700 mm at f/5.6. Exposure: 1/250 second at ISO 800. This is the full height image with horizontal crop to 8x10 proportions.